Bidding adieu to Tarangire, we broke down camp after breakfast, loaded up the Land Cruiser and drove on to our next stop: Lake Manyara National Park. To get from Tarangire to Manyara we crossed through Africa’s famous Great Rift Valley. What makes this area interesting is that it not only the site of the Olduvai Gorge where the Leakeys discovered “Lucy,” one of the earliest hominid skeletons ever found, but it is also now home to many Maasai tribal villages. In recent years, this has become an increasing problem for Tanzanian wildlife management. The animals—elephants, zebras, and wildebeest, in particular—have used this stretch of the Rift Valley between Tarangire and Manyara as a corridor for their migration between the parks and even into the Serengeti. As the Maasai have gradually abandoned their nomadic lifestyle and started establishing villages, they have essentially cut off the corridor for the animals and created a conflict between man and animal that historically had been avoided. If action is not taken to limit human settlement, the animals may be completely prevented from following a natural path to their winter food and water source. Unfortunately, there do not appear to be any easy answers to this situation. The northern entrance to the park leads into a thick riverine jungle along the eastern wall of the Great Rift Valley. The soil here is pinkish-red, and the omnipresent dust constantly kicked up by the passing safari vehicles makes every leaf and limb of the jungle within 10 feet of the road look rosy-pink. Seeing troops of olive baboons and blue monkeys is common in this part of the park, but the dense foliage makes seeing much else difficult. Click on photos to enlarge and view as a slideshow. We were super-excited to spot the elusive East African civet one morning as it slinked through the tall grasses of a marshy glade. With a face resembling a raccoon’s and a body like a leopard’s, this nocturnal member of the mongoose family was indeed a lucky sighting. You’ll just have to take our word on that one because the shy civet wasn’t kind enough to pose for any portraits. Lake Manyara is a hotspot for seeing many of Tanzania’s beautiful birds who are considerably more agreeable to having their photos taken. We were fortunate to sight several species of hornbills, a few of which were new to us, including Von der Decken’s hornbills with their colorful beaks and the silvery-cheeked hornbills with their impressive casques. 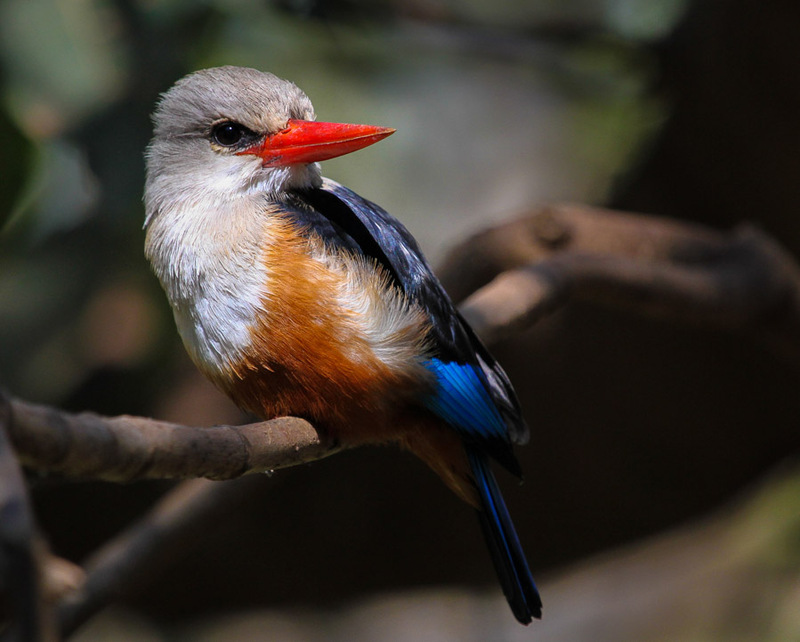 We also enjoyed several good looks at grey-headed kingfishers, numerous colorful little bee eaters and many of the other bird species that can be spotted throughout the park, including the long-crested eagle and the East African crowned crane. Our most exciting sighting happened on a full day’s drive to the hot springs in the southern end of the park. Our guide, Mansour, spotted a fresh buffalo kill not too far from the road. When we scanned the nearby bushes with our binoculars, several flicking tails alerted us to the dangerous predators resting nearby. We waited patiently for the lions to wake up and start feeding again to no avail, so we headed to some hot springs up the road with the intention of stopping back by on the return trip north to our campsite. By the time we came back, the lions were done feeding again and had resumed their rest positions in the shade of the bushes. It was early afternoon, and the temperature was starting to climb. The lions seemed restless. Finally, two decided they needed a change of venue and crossed the road right in front of our car. They quickly ducked into the shade of a mahogany tree, and we figured our lion spotting was done for the day. All of a sudden, there were strange noises coming from the center of the tree. We couldn’t quite figure out what was happening, but we could hear lots of shaking branches and snapping twigs. We were surprised when we finally saw the source of the noise. One of the lionesses was climbing up into the thick tangle of branches. 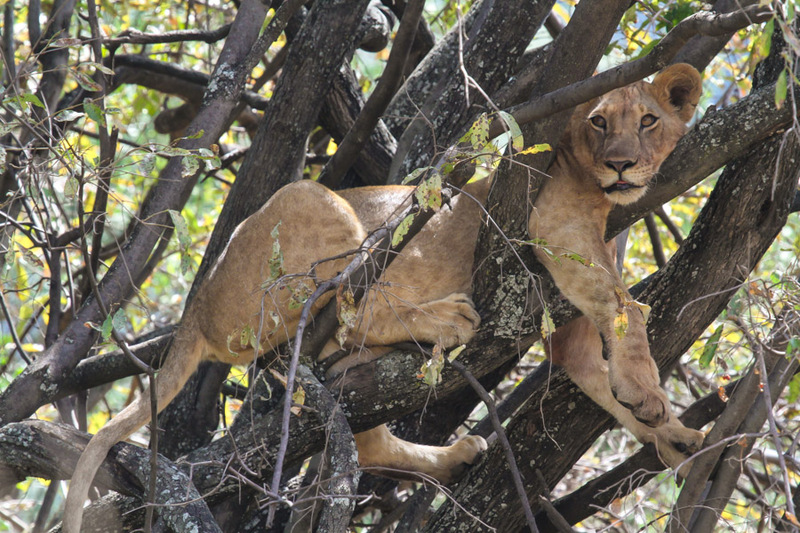 We had read about the tree-climbing lions of Lake Manyara, but we couldn’t believe that we were lucky enough to see it happen right in front of us. Apparently, the lions have adopted this behavior to avoid the annoying flies in the area. The clever kitties have figured out that the bugs only bother them at ground-level and have adapted to become tree-climbers. Not only does this allow them to escape the persistent pests, but they also benefit from the natural air conditioning provided from being off the ground. It was amusing to watch the lioness with her particularly full belly work her way through the tangle of branches. Once she settled into a set of branches that could accommodate her large frame and protruding stomach, she focused on positioning her huge paws and enormous belly over and over again until they were just right. Next, she tried to wedge her head between branches for support, but, hard as she tried, she just couldn’t seem to get comfortable. Every minute or so she would make an adjustment to one body part or another until finally she found a position acceptable enough to allow the well-earned sleep to come. How silly she looked sleeping in that tree! Check out the video below to see the lion in action for yourself. We guarantee it will make you smile. We really enjoyed our time in Lake Manyara. The scenery in the park is beautiful and diverse, and the opportunities for birdwatching are outstanding. If you are short on time or if birding is not a primary interest, you might choose to skip this park as the large-hoofed animals and cats are not as plentiful or as easy to spot here as they are in Tanzania’s other parks. With luck and patience, however, it is possible to see a good variety of species, both big and small. Travel Logistics: The village outside Lake Manyara is named Mto wa Mbu or “Mosquito River” in Swahili. We stayed at the Sunbright Lodge and Campsite, which had just recently reopened after extensive renovations by the new owners. It was a clean and pleasant place to stay at the quieter end of town, and we really enjoyed the facilities. In addition to the campsite and camper dining hall, they also offer comfortable rooms in a lodge as well as beds in permanent tents. Room and full board are offered at reasonable prices, and all guests are invited to enjoy the bar and nightly campfires. The place is run by a friendly South African couple who have spent many years managing high-end hotels and lodges in South Africa, Kenya and the Serengeti. They also have a travel agency called Livingstone’s Africa, and they can organize safaris throughout Tanzania for their guests. When we plan our next visit to Tanzania, we would certainly look into using their services. Owner Yuri is also an avid birder and was kind enough to take us on a bird walk in the nearby fields. Mto wa Mbu is much larger than the small collection of ramshackle shops found outside of Tarangire, and it was interesting to watch the village come to life as we drove through each morning on our way to the park. We saw vendors selling all sorts of fruits and vegetables on the side of the street, school children walking to their schools in their colorful uniforms (often involving the green, blue, black and yellow of the Tanzanian flag) while bicyclists balanced enormous, unwieldy stalks of bright green banana bunches on the backs of their bikes. Not all were working so hard. Tuk tuk and boda boda drivers relaxed, gossiped and shared the morning news as they sat perched atop their motorcycles. All the comings and goings occurred under the watchful eyes of the enormous, homely maribou storks who roosted in the tall trees lining the village road. The whole scene was a lot to take in, and we enjoyed passing through each day on our way into the park. Great bird pictures—-I hope many are winners at the camera club contests—-but the tree climbing lion was the piece de resistance! Thank you! The day that we saw the lions was actually my birthday, and I had told Matt when we were leaving on safari that morning that all I wanted as a present was to see a leopard lounging in a tree. I didn’t get my leopard, but the lions were a worthy substitute! She looks surprisingly comfy! I wonder how hard it was for her to get back down! I wonder, too. She was really high up there, and that tree was such a tangle of branches. I am sure a big leap must have been involved. It would have been fun to get that photo! Thank you, Rosemary. We appreciate you following along and taking the time to comment. Beautiful pics and video! Thanks so much for sharing! Thanks, Rob. I can’t remember if you and Amy did a safari after your Kili climb… Did you get to Manyara? A great National Park.. and nice photos! Great pictures! Who knew lions could climb trees? They must be very agile to maneuver in such a tight spot and all in the effort to find the perfect spot in which to relax. What a life! You are so right, Andy. Those kitties sure do know how to take relaxation to a higher level! Thank you, Mandela! It is fun for us to share them with you. Thank you for following along, and we hope all is well with you and the whole gang from Tanzanian Journeys. We miss your cooking. If only you could share that over the Internet! Asante sana!